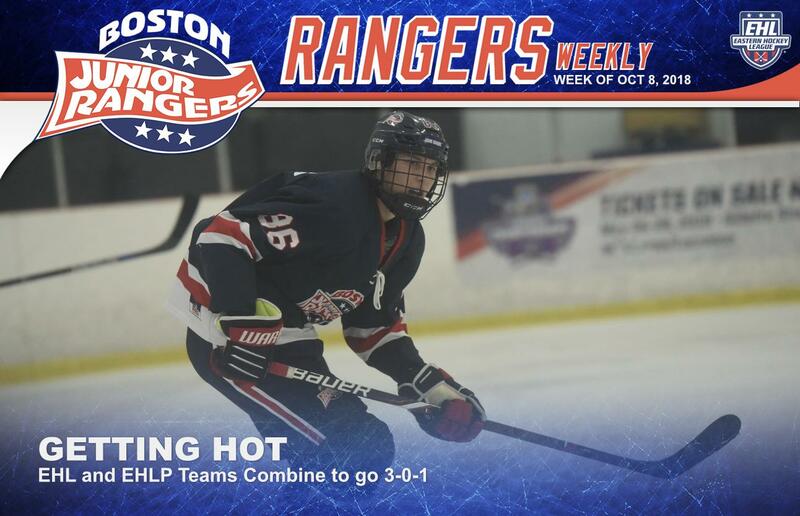 TEWKSBURY, MA -- Both Rangers squads got back to work this past week as the EHL team took care of business in both of their matchups, bringing their record to 6-5-0 on the young season. The EHLP squad on the other hand, took part in the first showcase of the year, splitting their 2 games to move to 4-2-1 for the year. On Saturday, the EHL team welcomed the Seahawks Hockey Club to town for the second of 4 matchups against their New England South opponent. The Rangers went on a 5 on 3 advantage at the 12-minute mark of the 1st period and converted a minute in, as Jake Maynard gave his team an early 1-0 lead. John Grealish added a 2nd period tally to give the Rangers a 2-goal advantage heading into the final frame. It was then Jonah Nash who found the back of the net just 4 minutes into the 3rd, giving the Rangers some insurance down the stretch. The Seahawks would spoil the shutout on the power-play in the final seconds, but the Rangers came away with the 2 points, winning the game by a final score of 3-1. Billy Girard was solid in his first start between the pipes this season, stopping 35 of the 36 shots that were sent his way. The squad returned to action on Sunday afternoon with a matchup against Team Maryland from the Mid-Atlantic South Division. The Rangers got off to hot start by scoring 4 goals in the 1st period, and taking a commanding 4-0 lead into the break. Zeb Scheffler, Mitchell Haight, Zack Norby, and Connor Galloway had the opening period tallies. The boys picked up right where they left off in the 2nd period as Danila Larionovs notched his 10th point of the season with a goal just 3 minutes into the frame. After a Maryland goal, Martin Pietraszek converted on the power-play around 4 minutes later to give the Rangers a 6-1 lead. Go Uemura added another insurance goal for the Rangers in the winding minutes of the period to increase the lead out to 6. Grealish and Will Roberts then tacked on 3rd period goals and the Rangers cruised to a 9-1 victory. Aiden Curry stopped 14 shots in the winning effort. After not playing on the first day of the Aston Showcase, the Rangers got to work on Sunday when they took on the Philadelphia Revolution for the 1st of 2 matchups against their cross conference opponent. After a late Revolution short-handed goal in the 1st half, Matt Orlando answered for the Rangers 6 minutes into the 2nd frame to knot up the game at 1 goal apiece. Xander Wardlaw gave the Rangers the lead around 5 minutes after. However, it was short lived as the Revolution tied the game at 2 just under a minute after that Following a scoreless overtime period, the Revolution came away with the extra point in the shootout over the Rangers. The Rangers were looking a for a different result when they came to the rink on day #3 as they went up against the Philadelphia Jr. Flyers in a rematch of last year's EHLP Championship. The Jr. Flyers struck 1st with a goal just 2 minutes into the contest, but it was quickly answered around 30 seconds later by Luke Marsh. After falling again, Matt McPherson and Wardlaw found the back of the net just over a minute apart from each other to give the Ragners a 3-2 lead going into the break. After the losing the lead on the power-play, Wardlaw responded with a power-play goal of his own to give the Rangers a 4-3 edge. Orlando and Levi Hensley added insurance goals in the final minutes of the game to lead the Rangers to a 6-3 victory. Ryan Bevan stopped 14 shots in the winning effort. The Premier team on the other hand, will travel for a game with the Warriors on Friday night and will then return home to face-off against the New England Wolves on Saturday. Following those 2 matchups, the EHLP team will host the Warriors again on Wednesday at Stoneham Ice Arena.